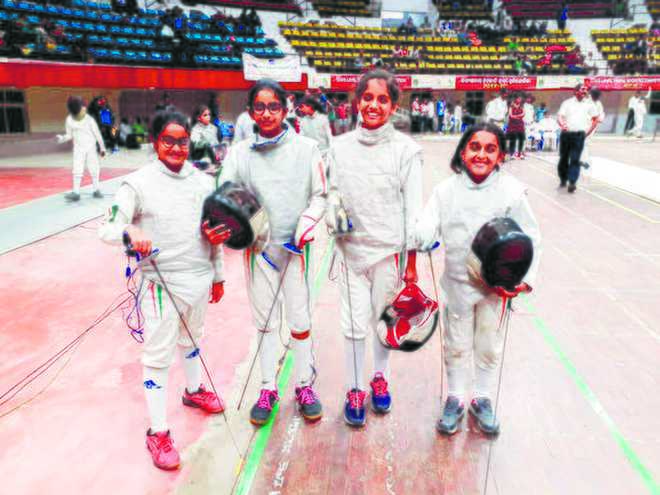 City fencing team of Ekam Toor, Era Pathak, Himani Bhandari and Mahira Batheja — all students of Carmel Convent School, Sector 9 — won a bronze medal in the foil event at the recently-concluded 20th Sub-Junior National Fencing Championship for girls in Cuttack. The side drubbed Andhra Pradesh 15-1 before beating Telengana 14-11 in the quarterfinals. They, however, lost 11-15 to Tamil Nadu in the semifinals. In the individual category, Ekam Toor won a silver medal in the foil event. She defeated city mate Himani 15-10, Chhattisgarh’s Dipaanshi Netam 15-6, Velentina of Manipur 15-13 and Karnataka’s Letitia 12-6 on her way to the final, where she lost 8-9 to Kerala’s Ashitha Joys. Ekam had won a gold medal in the 8th Mini National Championship held in Nasik, Maharashtra, last year, while she bagged a silver medal in the National School Games in Nalgonda, Telengana, in January, this year.